Upon waking-up on our third morning in the city of Jaipur, Ellen somewhat indecently demonstrated that she was again farting with confidence. We set off, therefore, on a full day of sightseeing .. and for precautionary insurance purposes, carried a couple of spare loo rolls inconveniently but appropriately packed within our bum bags. Bumped along again by private auto-rickshaw, our first stop was the Amber Fort, 11 km [7 mi] north of central Jaipur. Into the bowels - for want of a better expression - by a series of exhausting stone steps. 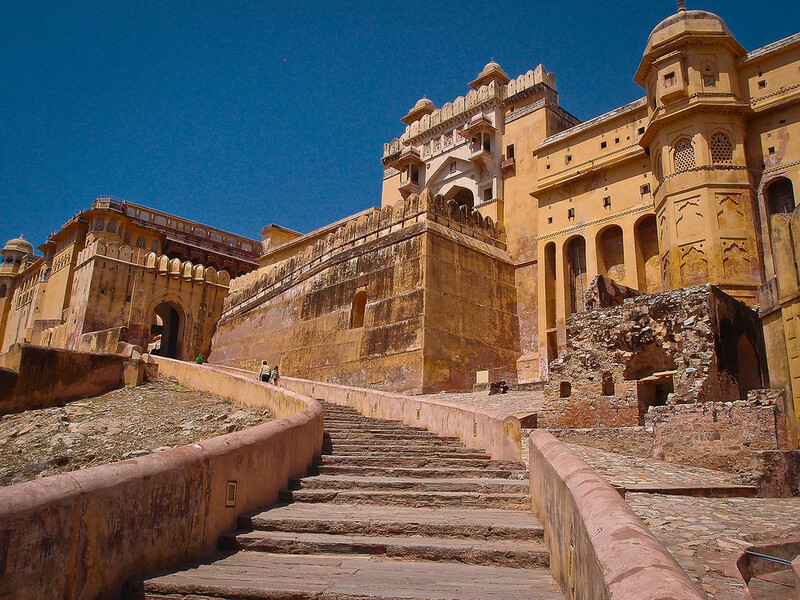 The fort and palace grounds are sprawling and at 40°C saps your energy. 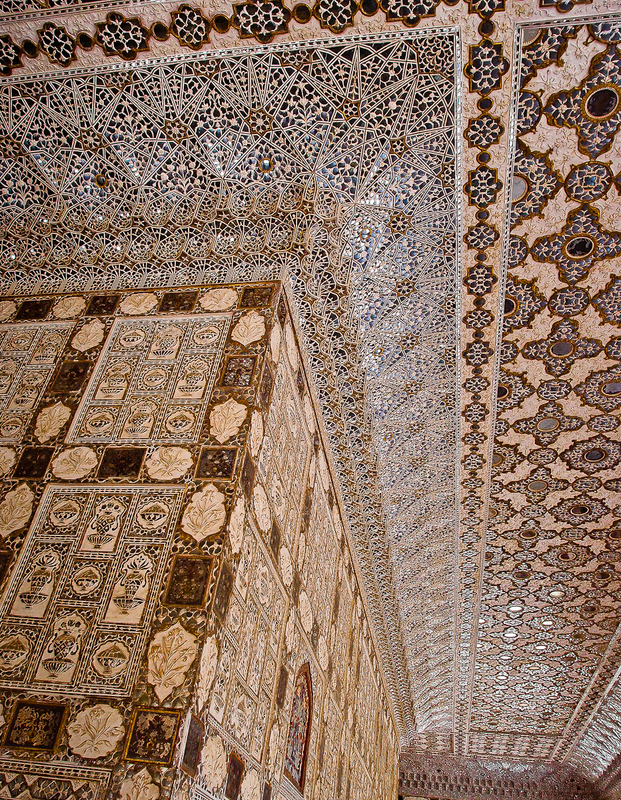 The main sights within the palace include the Sheesh Mahal, adorned with thousands on thousands of mirror tiles on the walls and ceiling. 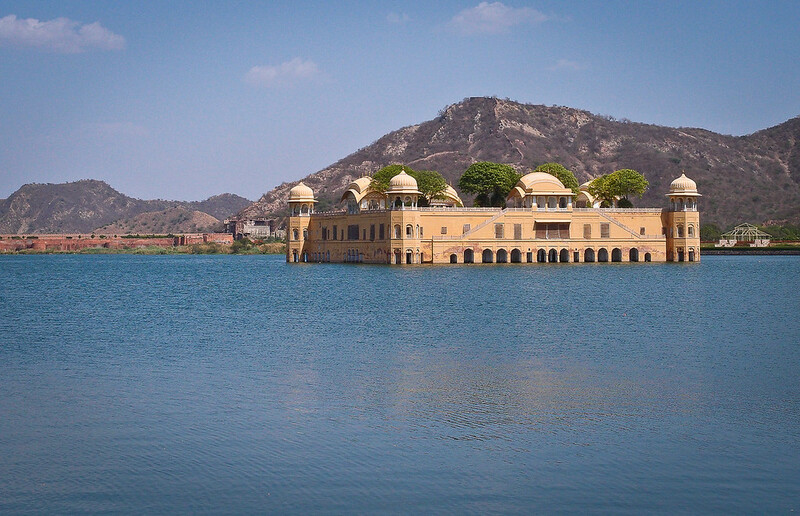 A view of Jal Mahal (Water Palace) from the road to the Amber Fort. That evening we were hosted by Rajesh Sesodiya and his wife and family in their private home, located about three kilomeotres from our hotel. 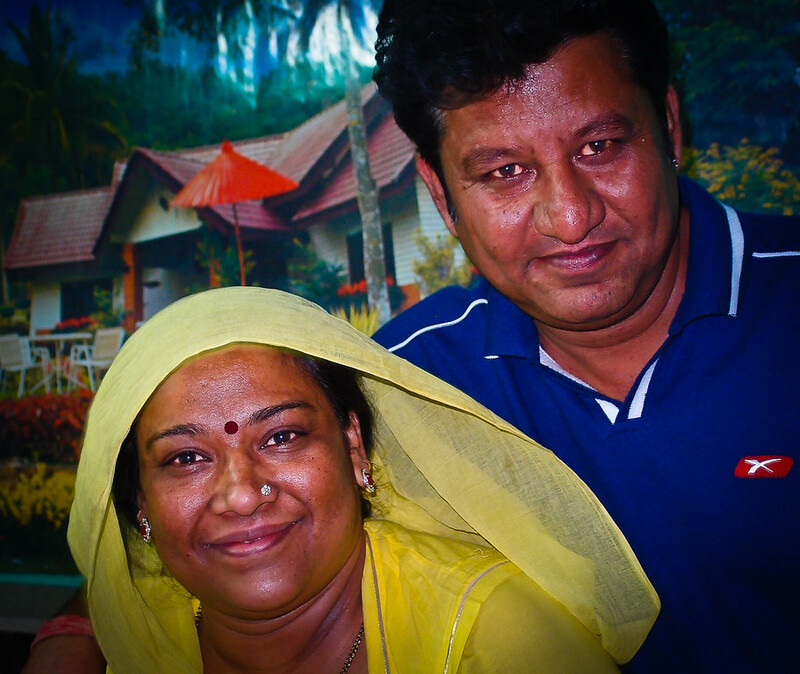 Rajesh, a local tour guide operator, had taken good care of all our needs and wants during our three-day stopover at the Sugan Niwas Palace, an old 1940s colonial home that has been converted into a heritage boutique hotel. Rajesh is a charming oddity. 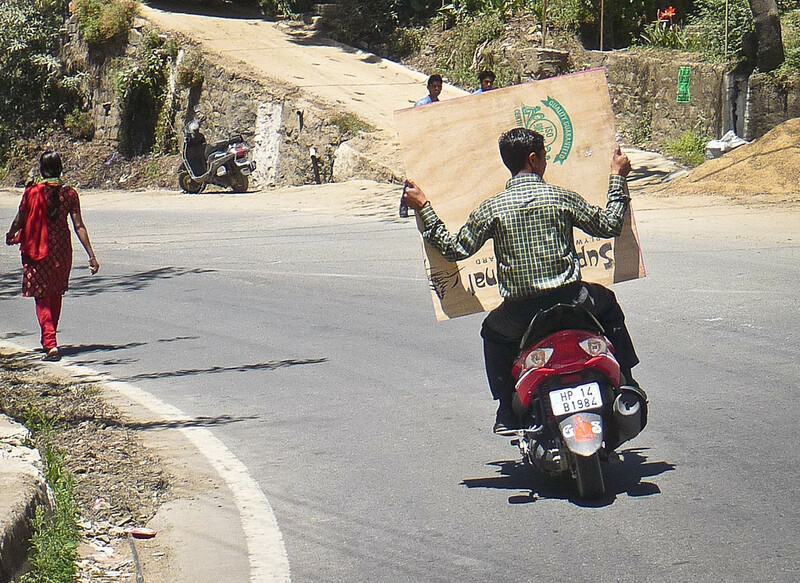 He asked for nothing in return for his kind hospitality, which I have to say is unusual by Indian standards, as most are more-often-than-not angling and hustling for some sort of payback. 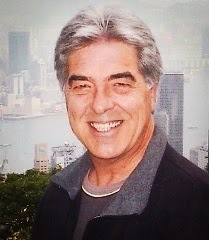 It was a wonderful and memorable evening. 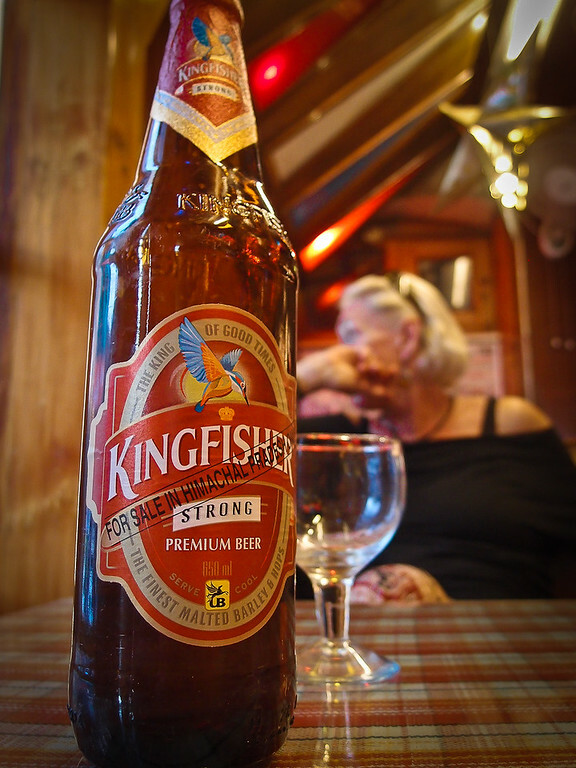 'Kingfisher' is most recognised and widely available beer and the top rival Indian brew, which comes in two broad strengths: 'regular' premium (around 5% alcohol) ..
.. and a generous 'strong' version at 8.25% abv, which has much more flavor than the regular Kingfisher premium. Strong - and not for the feint-hearted! 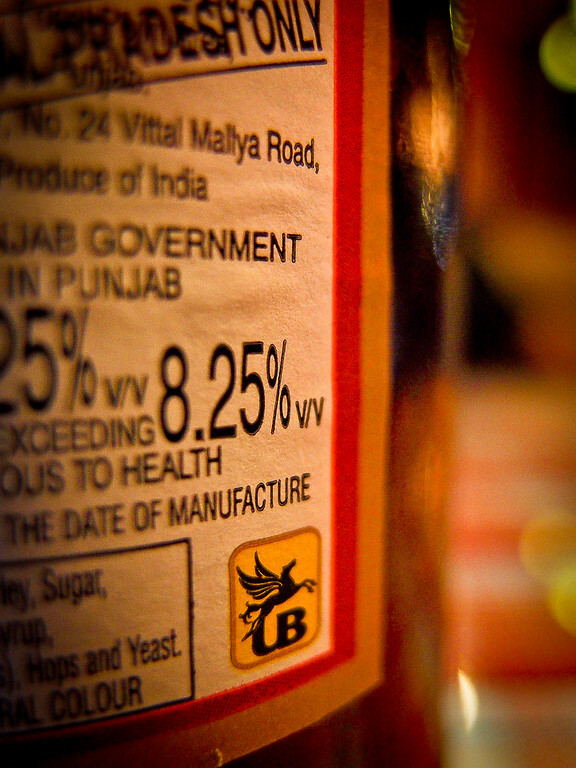 Another variation is Kingfisher Blue, marketed at the young and trendy. This is also a strong beer with around 8% alcohol, but it has a very light watery taste. Distinctive and full-bodied Kingfisher Ultra, made from imported ingredients, is the newest Kingfisher label to hit the market. 336 northbound kilometres [209 mi] later, deliberately avoiding the 17 Million inhabitants and scorching mayhem of New Delhi, brought us to the unremarkable city of Hisar in the state of Haryana. 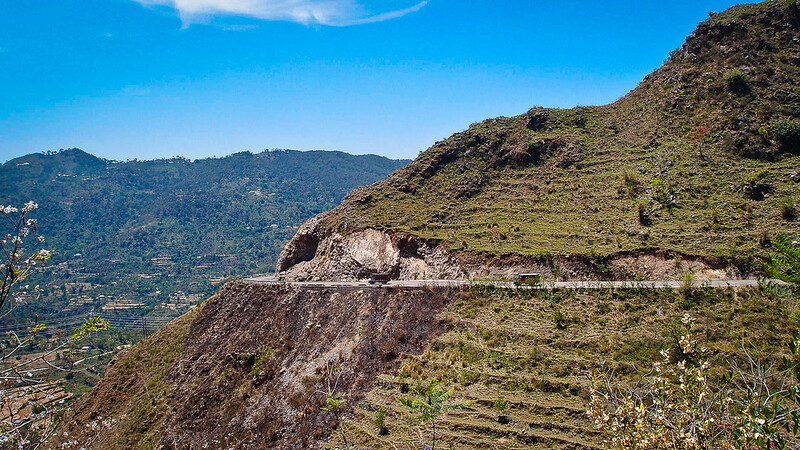 I say unremarkable, because that is what we were expecting; just a stopover place to lay our heads for a night on our way up to the scenic Himilayan mountain regions of northern India. Next thing we knew we were ushered into the ceremony within the hotel complex. Inside the hotel the very nervous bride waited for the groom alonside her father, with a Jaimala/Varamala, which is a decorated garland. 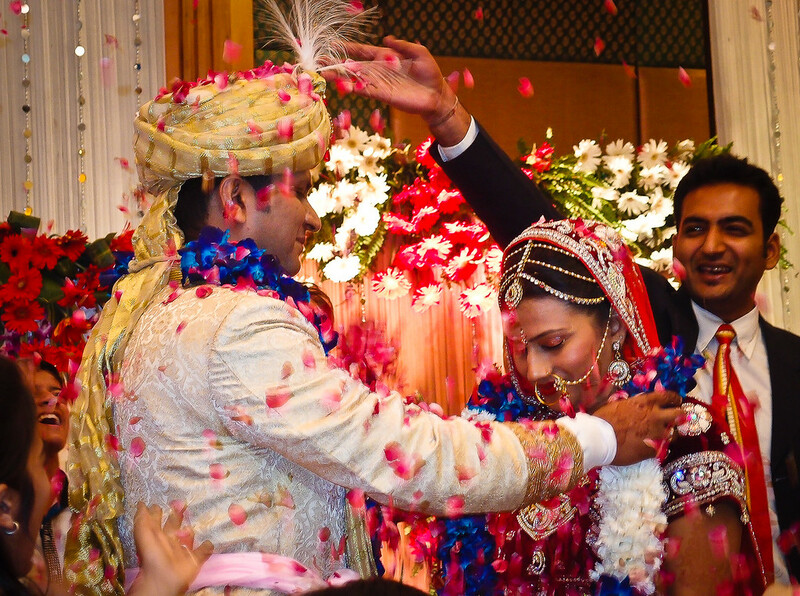 Soon after the groom arrived, the bride and groom exchanged garlands. 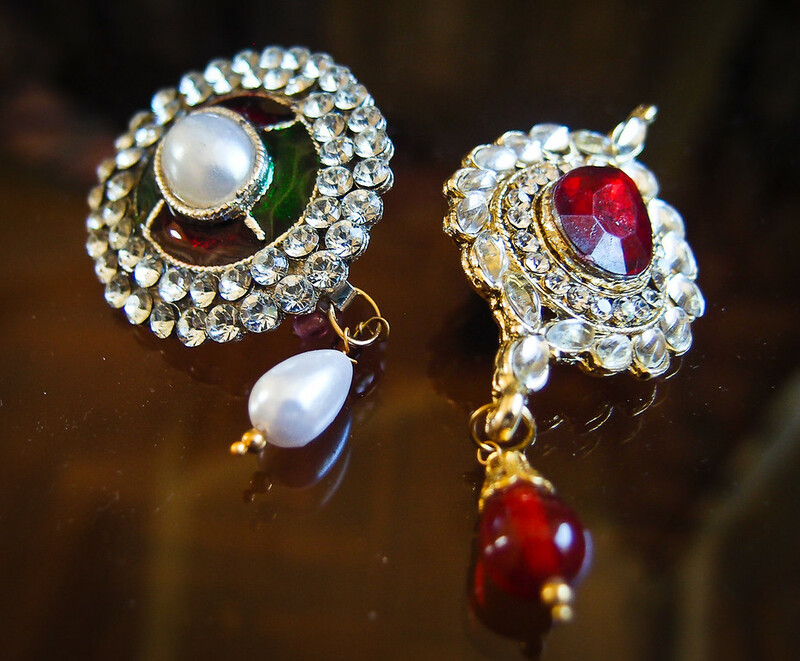 On a lighter note, it is considered that, whoever puts the garland first on their partner, will have an upper hand in the marriage. Literally front row seats; we received 'guests of honour' status; then plied with copious amounts of food and beverages - which we really didn't need, as we had just stuffed ourselves over the road at the local McDonald's - and were given jewelled broaches as our souvenirs of the occassion. 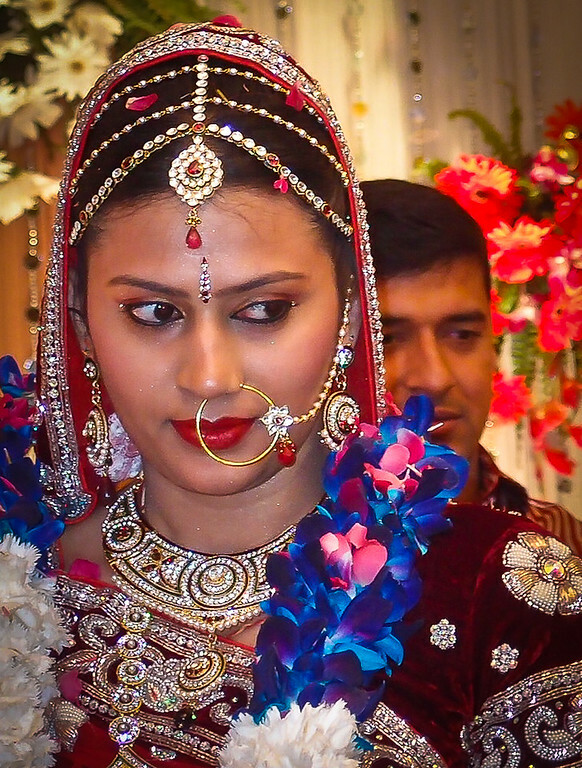 It was a complete surprise, and a privilege, to attend this very colorful affair. The bride and the groom clearly stole the show with their exquisite outfits, although the attending families and friends, relatives and other guests were also wearing very grand clothes .. [erm] except for us, in our daytime jeans and t-shirts! After a second night heading north, stopping-over in the deviantly familiar and idiosyncratic (compared to the rest of India) city of Chandigarh, with all its ostentatious prosperity, it could be compared to many cities in Europe ..
.. we headed-off towards the foothills of the Himilayan mountain range, and some temporarily relief from the heat of the Indian plains. 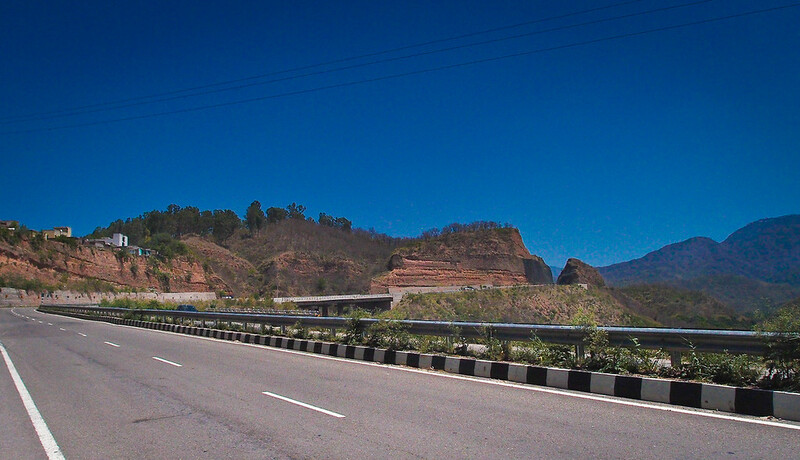 It was great to negotiate curves and bends after two weeks of mostly scorching straight roads. 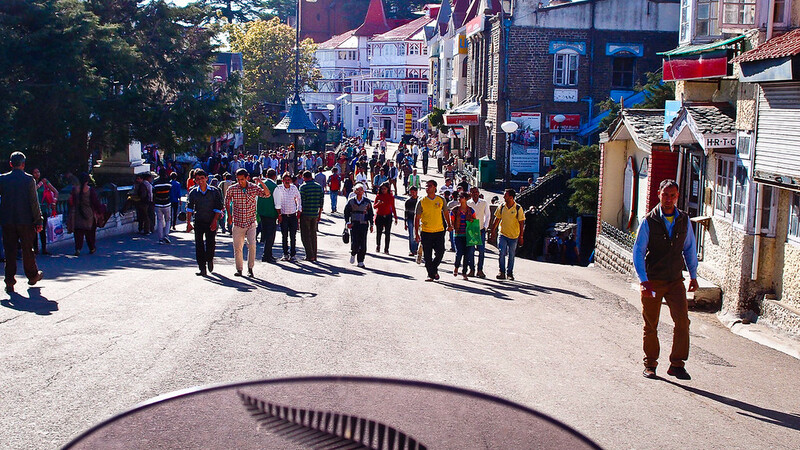 By late afternoon of Mon-28th we arrived in Shimla. It was a 'cool' 25°C; the perfect temperature for a couple of previously wilting northern Europeans. 20 seconds after snapping the above picture I was pulled over by the cops; got arrested, had the bike impounded, and after an hour or so of negotiations ..
.. 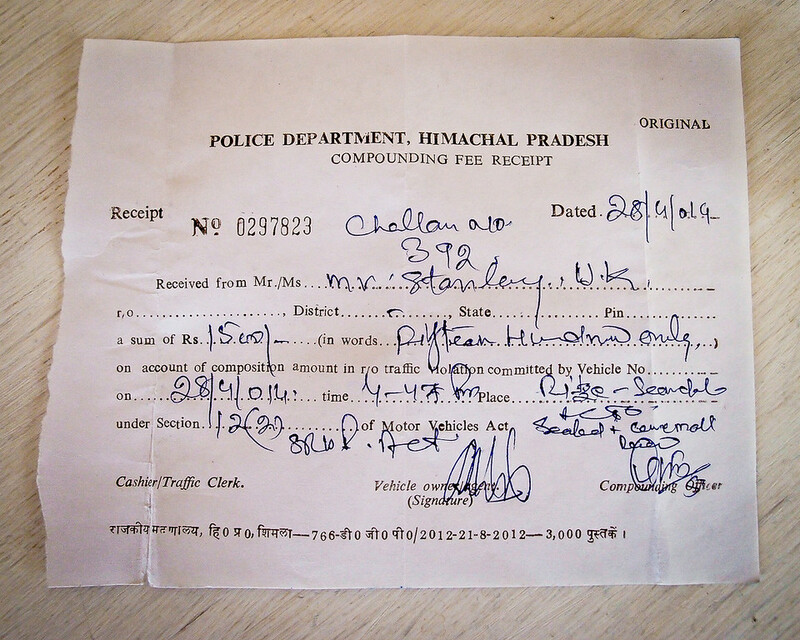 I was fined 1,500 rupees [15 quid, or US$25]. Apparently I had violated some local law by riding through a consecrated pedestrian precinct called 'The Ridge'. 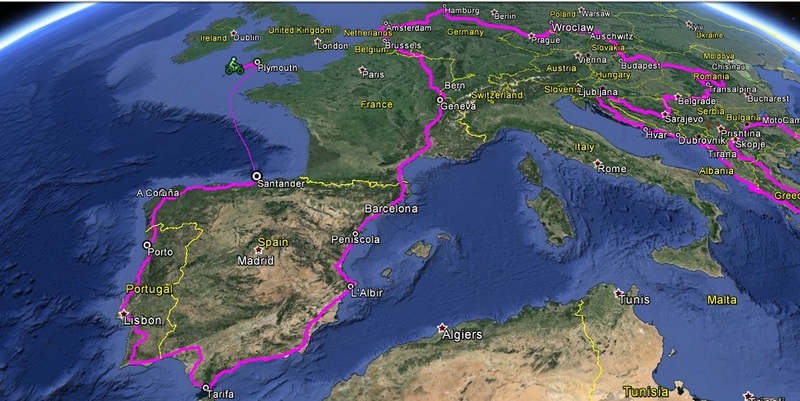 No-one told my GPS unit! 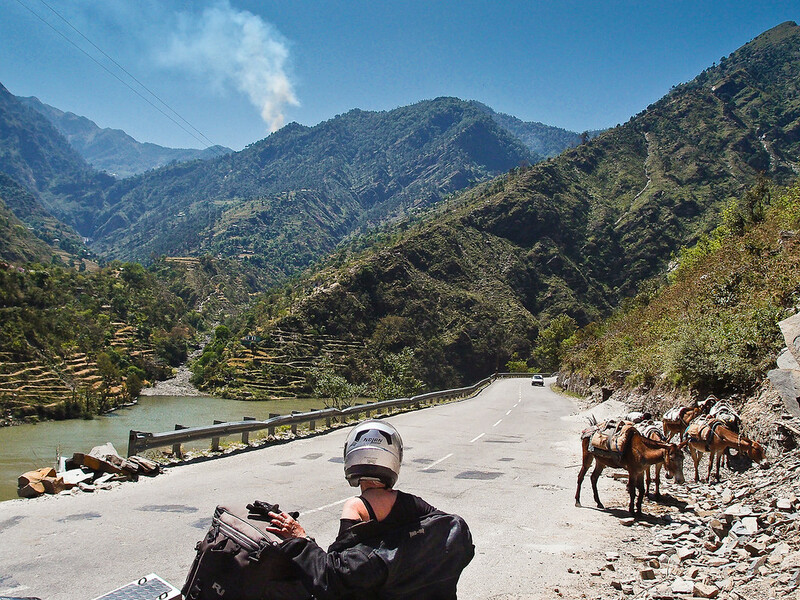 We have spent the last few days riding around the Himilayan Mountain Range. As you would expect, the scenery has been simply stunning. 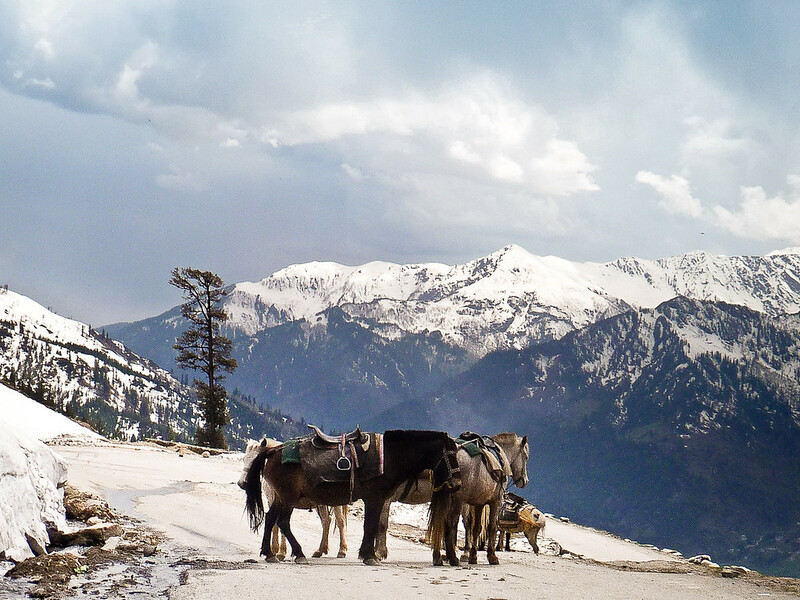 From the township of Manali, at the northern end of the Kullu Valley in the state of Himachal Pradesh, we rode up the Rohtang Pass as far as we could go. 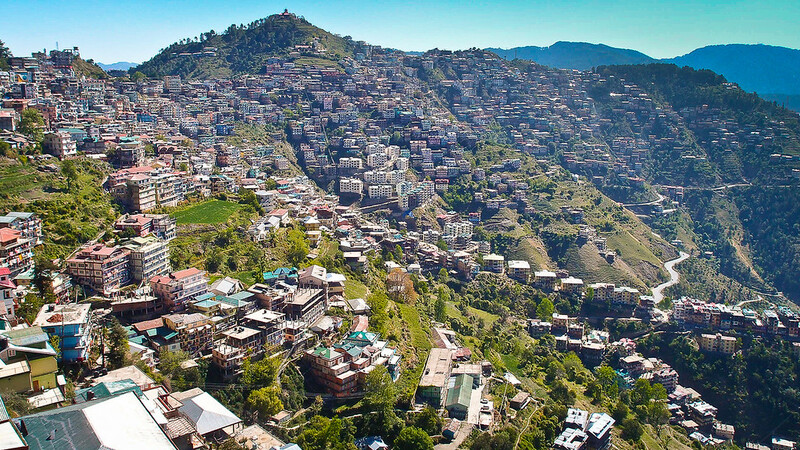 A very popular destination for Indian city-dwellers, often from Delhi, seeking relief from the relentless heat at this time of year. 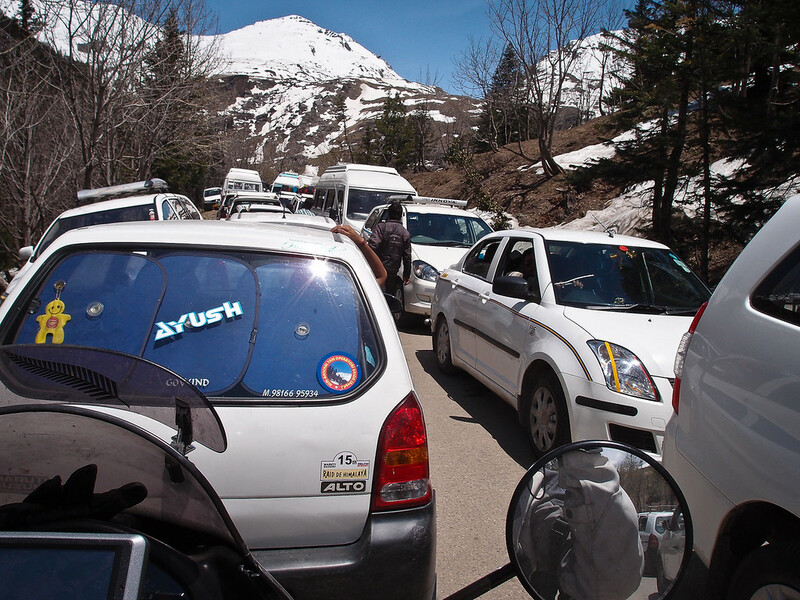 At around 2,300 metres [7,500 ft] the traffic scene was chaotic. Incidentally, you can buy a car in any colour you like in India .. as long as it's white. My GPS unit eventually recorded an altitude 3,036 metre. Almost at 10,000 ft. We had reached the highest elevation of the trip. We could go no higher as the Pass was, and still is, closed to all vehicles at this point. It won't be fully open for around another month, at the beginning of June. 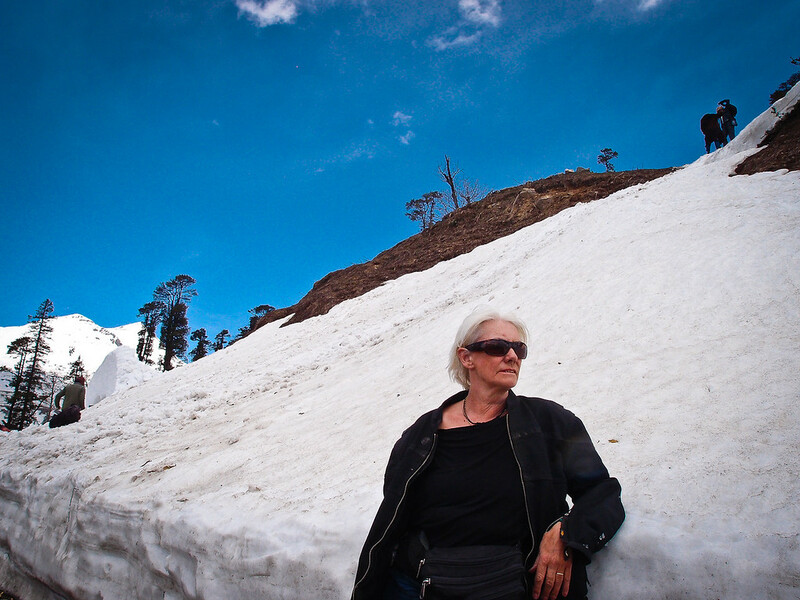 We are currently in the Himilayan township of McLeod Ganj; not far from Dharamsala. 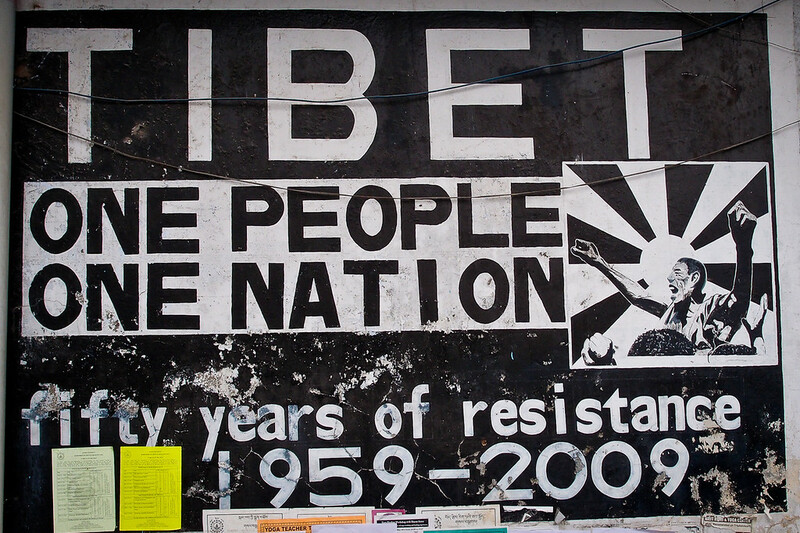 Since 1959 McLeod Ganj has been the home of the Dalai Lama and the Tibetan Government in Exile. It seems to be a very popular hang-out for foreign hippies and, as you might expect, students of Buddhism. The Wagah closing ceremony at Atari on the border between India and Pakistan; a daily ritual described by Michael Palin for one of his television around-the-world travel programs as a display of "carefully choreographed contempt." Should be fun to watch.